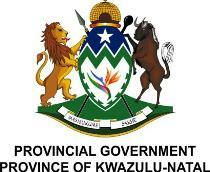 MEC Thembinkosi Willies Mchunu is the Premier of the KwaZulu-Natal Provincial Government since 24 May 2016. He is also the Chairperson of the Parliamentary Executive Board and the Chairperson of the Rules Standing Committee. Premier Mchunu is the former Member of the Executive Council for the Departments of Transport and Community Safety & Liaison. Born in May 1948 in Ladysmith, MEC Mchunu grew up in Chesterville, Durban. He was a Union Organiser for the Metal and Allied Workers Union as well as a Trade Unionist Member in the 1970s. He was part of the African National Congress underground structures in the 1980s. He played various roles in leadership in the Province of KwaZulu-Natal, including being part of the peace talks between the African National Congress and Inkatha Freedom Party. Premeir Mchunu served as chairperson of the ANC Northern Natal Region in 1990. He was the deputy speaker of the Legislature in KwaZulu-Natal in 1994 and became a ANC provincial executive committee member in 1995. He was elected SACP provincial chairperson in1998. MEC Mchunu became the Speaker of the KZN Legislature in 2004. He was also the Executive Member of the Provincial South African Civic Organisation.